Back to school time is a great opportunity to stock up on craft supplies for the year. I love shopping for new pencils and crayons for my girls and we always make sure to have a good amount put away for during the year. This week we have been testing out some great Crayola products. Crayola have been a favourite brand in our household for a long time, and it has been nice to test out some of their new items, along with some old favourites. As a teacher, I’ve purchased lots of pencils and textas in the past, and I have learned that it pays to buy quality brands. The cheaper, no name brands tend to dry out very quickly and don’t last very long at all. With the Crayola brand you know that they will last a long time (provided they keep the lids on – something my kids are terrible at!). The best feature of the Crayola markers is that they are washable! If you have a toddler you will only ever buy non washable markers once. Trust me! It can take days to get texta off a 1 year old, and don’t even think about the damage to your couch or walls. These markers really do wash off easily with a bit of soap and water and will wipe off most items. I love them! We also use our washable markers on the white board. The twistable crayons have been great too. Once they learn not to twist them too far, these crayons last a lot longer than regular crayons and don’t break as easily. We’ve had lots of fun with our new craft supplies. If you follow us on Instagram we will be sharing some of our creations this week. 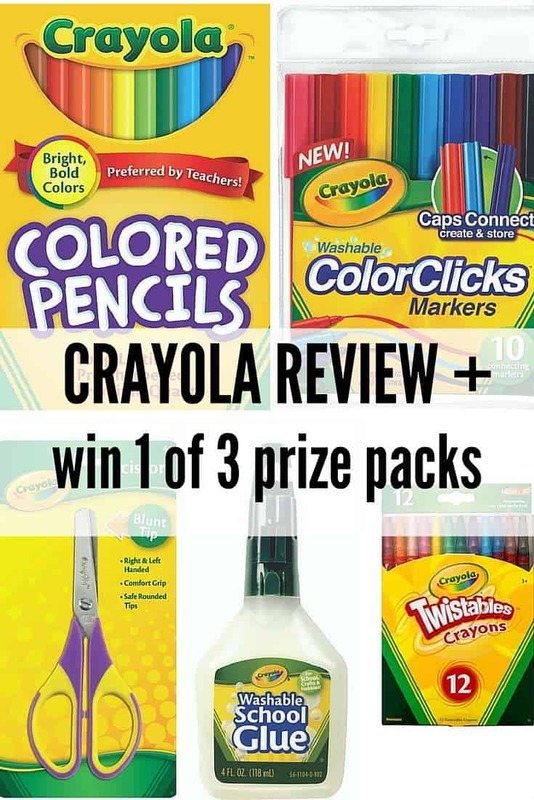 Crayola have kindly offered to give 3 of our Australian readers a lovely back to school prize pack. Enter below. Open to Australian residents only. This competition has now ended. Congratulations to our winners: S Mataia, J Torr, L Tice. All winners have been contacted via email. Little Miss is all of four and a half and is off to pre school this year. She LOVES drawing, especially birds, and she would be so very happy to be sent off to school with this ‘Artists Kit’! Love Crayola they only products I’ll let my kids use as I know they are non-toxic and wipe off from walls and floors. As he wants all the latest arty trends! He loves to draw, colour and paint. To win these pack would make you his best mate! This would be perfect to keep my niece entertained when she visits…although she’s more likely to put them in her bag and take them home with her!!! With two young grandchildren it is always good to have Crayola products on hand to encourage activity and creativity. My sweet eldest daughter just loves craft (the middle one couldn’t care less – just wants to climb trees) – so would love to win these for her birthday please. I’m a teacher too and you cannot go past Crayola twistables! They last forever, and stop kids chewing leads! Thanks Crayola! My kids are both learning to be so creative through their writing and drawing.. A but of new colours and markers will help keep them motivated. My daughters live for craft. They go through so many pencils, markers and so MUCH paper. This would be a welcome addition to our extensive collection, as we use so much so fast. What an awesome prize with my crafty kids we can never seem to get enough stuff ? My kids are really into drawing treasure maps at the moments so they would love this prize. Anything craft related is loved in this household. You can never have enough pencils, crayons, glue, cardboard etc for the many projects we complete! My boys love to colour.. this will help be a boredom buster! I have 3 kids who all love to draw, colour in and create things with paper! This pack would be a huge hit with them, plenty to share which is always great (love when they share!) and it would give them hours and weeks/months/years of fun! They’re such creative kids and I love seeing what they come up with. To start her love of drawing and all things creative! Because my kids love art and craft activities! but he did my passion for art. from me he did get that part. My son loves all things crafty at the moment and loves nothing more than making a mess. At least with Crayola, making cleaning easier for me, I don’t have to stress as much when his creative mood strikes! I have 4 nephews that love to colour. They’d have lots of fun with Crayola. Creativity makes us all happy and Crayola is the original King of Creativity. And my little one enjoys colouring while mum does her own adult colouring in. my son is just starting to attempt “neat” colouring in, so would love some new colours for him to keep practicing his new skills. This would be perfect for my son who is starting school in a few weeks. my son , a great foundation! Crayolas got the goods for some. Crayola gives us quality fun time together as we both get involved. Crayola is the best brand for bold, strong colour to add to any project. My daughters school does not allow stationery to come home (even though I purchased it) so my daughter would love some stationery to keep at home for all the arts and crafts she loves to do. My eldest got heaps of stationary as xmas presents and will not share, so this would be for my toddler. Because she loves art, it warms her heart! To embrace and enhance her love of drawing, bringing it into a controllable form, paper perhaps……..at the moment chalk is her thing and she refuses to draw on the blackboard, opting for ALL outdoor surfaces!! But the love and joy is there! Master Five and his creations will adore this bundle of creative release! I can teach alphabets to my little girl with these fun loving colors so that she wont get bored while learning. My Grandson, Taj, lives with me. He’s 6yrs. He’s driving both him & me slightly more insane each & every day of these school holidays. He is beyond bored & I don’t have too much for him to do here yet. I’m getting there though. He really doesn’t ‘get’ why there has to be school holidays & if he had his way, he’d be at school 7 days a week with his friends! I would LOVE to win something like this for him. We do have a craft box, but it’s pretty wanting & I know he’d be thrilled to have a package like this arrive in the mail for him. He really is a great kid! Long car trips don’t have to be boring with Crayola for colouring and drawing. crayola keeps my 3 busy for hours…. love watching their creativity flow! would love to win this prize for them! Hmmmmmm fun for the kids, and me too!!! Love to draw, always have….fortunately my little ones have it too, and they’re good at it. Those extra little goodies to make pencil cases all the more fun, exploding with colour, on the greyest day there is, that first day of school. With 3 little ones aged 4 and under, keeping them occupied with this fantastic Crayola pack would be a nice change from the boredom and sibling fighting that happens on rainy days! A fun way to learn and play! After spending 2 hours scrubbing texta (obviously not Crayola) off the kitchen cupboard, this would be an awesome prize for my wee grandson, Ben…..and me too!!! They can be so creative and the creativity is endless!! oh i love CRAYOLA!! saves me in so many ways from two kids going nuts! His mum and dad can’t draw stick me! surely this little man could be the next Picasso. Smiles all round! Smiles from the kiddos because of the beautiful, magical colours and smiles from Mummy because of the beautiful word washable!!!! Miss 2 has amazed me with her word writing and drawing of cows. She loves cows and wants to ride one. She will be home without her brothers this year and us two girls are going to live it up for our last year before school. We will draw and build and make and best of all with Crayola we will smile and laugh. My boys love to draw and get creative. I need some school holiday entertainment that’s not going to cost an arm and leg, some new crayola should do the trick. Little miss 8 likes to create cards for her friends and family for birthdays and special occasions. She is always drawing, cutting and pasting up a masterpiece. I try to encourage her creativity and what better way than with a pack from Crayola. I am speaking of my inner child. My three boys are spinning in circles right now to see who falls over first. They NEED Crayola! My two cherubs would love this, they loving drawing and colouring. It’s amazing what their imagination and creativity makes. It’s vibrance of colour that my two like in drawing materials. I still think Crayola products are some of the best in terms of colour depth, as well as quality and longevity. Wow, what a great way to get organised fro Back to School and beat the school holiday boredom blues at the same time! He just looked over my shoulxer, pointed at the screen and said, “Ooooh what’s those? Rainbows?” He’s a bit obsessed with drawing rainbows at the moment. It’s state-of-the-ART. It looks good on PAPER. It’s SHEETS ahead. It’s great for the kids to get creative, crafty and show their true COLOURS! Drawing, colouring and inventing creations are all such fun ways for our kids to use their imagination. We love making our own gift wrapping paper and cards as well. with three young artistic children, there is never enough pens pencils textas and the likes to go around! they would love this as much as all the recycled paper their daddy bought home from work, and with washable inks, makes my job of scrubbing tables and walls easier!! My six year old is starting school this year, and I wish his teacher the very best luck in convincing him to draw anything other than dinosaurs. He draws them on everything, everywhere. haha. Glue , scissors and markers are like gold in this household at the moment. And I don’t mind one little bit. Kids of all ages would love this Crayola pack form Kinder to Year 12! Something for everyone! My kids love trying to recreate their favourite tv characters but with added powers! They would spend hours with this prize. He just loves drawing. His desk is like a production line and his pencil case needs frequent replenishment. our little miss loves making cards for people!!! As a teacher there is always that one child who doesn’t have the tools needed to learn. I would love to sneak this prize into their desk. Our creative busy toddler goes through so many art and craft supplies and would love these fantastic products because she could colour to her hearts content and I would know that any mess would be washable and kid safe! My sons an artist in the making and this pack would give him the chance to be more creative! Drawing and creating, making master pieces. Pieces that will go on the fridge or the album. All of which being colourful and to me looking like squiggles. Miss 2 is colouring in mad and once her big sisters go to school next week she will need something to keep her busy! My big girl is in Year 1 this year and that massive haul is most of her booklist for this year! She would love it! Crayola’s fun bright colours help kids express themselves and learn about the world around them. Love that it’s non-toxic too- so important! Crayola’s are a great tool to foster creativity and the kids just love drawing with them! Every kid knows there are two great ways of expressing yourself. One is emotional and often results in time out. The other is artistic and often results in praise. The first can be done without any equipment at all but the second is best achieved with a wide range of drawing tools. So this pack will be great. Especially they always wet Easter holiday. So generous of both Crayola, and My Bored Toddler, for this offer of a legendary product, that has very much lasted through ages; YES, ages. With Crayola, our youth have become sages!!! They would express themselves in creative ways … I only hope its on paper not the walls again!! Imagination buzzing; rainbow colours galore – Crayola brings out their inner Picasso that I proudly display on my fridge! Crayola is our favourite brand and encouraging creative and imaginative minds this prize would be used to full creativity and exciting possibilities..
Great giveaway for this time of year. Bored kids are looking for something new to do. Crayola have always been my go to products when getting the kids creative, my toddlers would be over the moon with these and would mean lots of crafts at home and spending time together! we love Crayola! Hours of fun! My two year old is enjoying exploring different ways of being creative. This prize pack would help her express herself in different ways and bring on lots of smiles and enthusiasm. I have three children under 5 that would love nothing more then to create a masterpiece with this craft set.